Ahmad Shaher Mohd Fuad,26 years old, from Teluk Intan, Perak is the second child from three siblings. He is one of the alumni of Universiti Sains Islam Malaysia (USIM) has been the pride to his former Faculty of Syariah and Law (FSU) and now serving as a syarie lawyer in his own legal firm. His excellence performance has indeed proven that USIM graduates are capable of creating and achieving their own dreams in the ever competitive career world. The following is the interview report about Ahmad Shaher’s success story, and it is hoped that this will be an inspiration to all USIM students. “My father works as a policeman while my mother is a housewife. Talking about my academic background, I graduated from USIM in 2015, before furthering my studies in Diploma in Islamic Judiciary and Advocacy Practices (DIJAP). “After finished my studies, I did my chambering at Tetuan Nizam, Harlina & Co. and then, in April 2016, my friends I have successfully opened our own legal firm, Syarie Lawyers: Shazril Khairy Mustafa & Associates”. “Lawyer is my dream career since I was a little kid. I regard this as a special profession that enables me to help society. At the same time, I hope that I can uphold the Islamic legality in the search of justice and I pray that in future, more and more graduates from Syariah and Law studies will take the opportunity to be syarie lawyers due to the high demand of professionals and practitioners in this field. I can see the bright future in this profession”. “I was actually being exposed to this career when I studied at Sekolah Menengah Agama Kebangsaan Ahmad Said, which is, fortunately, a foster school of USIM. I would like to confess here that I was actually a second intake student in Tamhidi (Matriculation) Centre, USIM. Of course, being a student who was not around since day 1, I was a bit lost at the beginning compared to my other counterparts. However, that did not dampen my spirit to be successful, anyway, as in my first year in the Bachelor Degree of Syariah and Law (SMSU), FSU, USIM, I actively participated in Debate Club to polish up my talents and skills in debating and performing oral presentation. As a result, I was selected as an English debater of the university”. “During my studies, I never missed the annual Moot Court Competition, in order to familiarise myself with the simulation in real court. I can still remember the moments where I had to burn my midnight oil to prepare my motion systematically in order to convince the juror. This memorable experience has assisted me a lot in my current works as it helps me building my confidence as a lawyer and also as an administrative manager”. 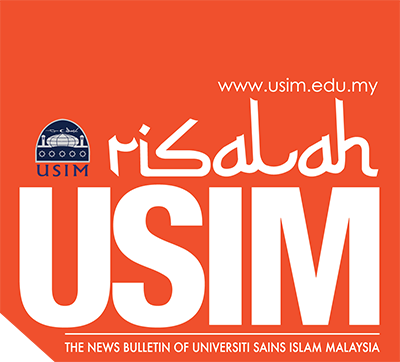 “I owe my appreciation to USIM who has shaped me in becoming who am I now. The integrated knowledge on civil and syariah law that was taught to us has actually helped us a lot in analyzing and solving cases from both perspectives. I believe that my USIM friends and I are in the added advantage compared to the others, since we are able to view a case in a more thoroughly procedure”. “If we talk about trials and tribulations, we have to remember that any job comes with their own package. The same goes to me. My main challenge as a syarie lawyer is in dealing with cases from all over the place in Malaysia, where every state has their own regulations and guidelines. I think every newbie syarie lawyer has to remain calm, diligent and be prepared mentally and financially; before he or she can be officially accredited as a lawyer. This is the price of being a lawyer”. “In addition to that, the other challenge is about facing the negative perception towards a career as a syarie lawyer, which said to be less superior compared to a civil lawyer. In fact, many university students stay away from venturing into this noble field due to this misleading perception. However, thanks to the government’s recent efforts to uphold the Islamic legality system in Malaysia. This has directly empowered the functions of syariah court and syarie lawyer to play our roles in the society”. “I actually have two dreams which I have had since my childhood. Firstly is to have my own legal firm, and in which, alhamdulilah (Praise to Allah), I have achieved it now. I wish that this legal firm will speed up my career since I can see great prospects awaiting this field. I need to venture into certain Syariah fields that have not been completely explored and I hope that my legal firm would be able to provide intensive trainings and coaching to students who wish to be certified syarie lawyer. As I said just now, this is a new field compared to other careers and yet, many great potentials are available to be optimised”. “My second dream is to establish my own syariah-compliant hospital, since I can see many great potentials in the health industry in the future. I understand that many local Malay Muslims (bumiputera) companies do not have the courage to explore such industry due to the high cost of building and maintaining a hospital. Since there is no harm in dreaming, so let say if I have my own hospital, I hope that it can serve the underprivileged community especially the senior citizen and children”. “To all students who wish to be syarie lawyers, first and foremost, you have to be passionate and love this profession as you are going to live with it for the rest of your life. A syarie lawyer will face the ummah problems especially on family institutions. Therefore, a syarie lawyer shall not focus on the financial reward, but our job is to find the best solution to solve a case”. “In a nutshell, I would like to advise everyone to fully utilize your time in the university to be actively involved in organization, self-development and other beneficial programmes because all these are very useful after your graduation. You need to balance yourself between co-curriculum and academic, since academic achievement is also important in determining your future career soon”.